Today we have not one, but two brand new Me to You collections to share. We love these collections, the decoupage pads are just beautiful and so versatile. With theme's of Mother's day and Easter the collections are perfect for seasonal crafting, but the great thing is that the majority of the range including the papers and decoupage can also be used for everyday crafting too. Me to You Tatty Teddy has a fabulous new Easter collection full of colourful patterned papers, decoupage and embellishments, to create delightful handmade Easter craft projects. With a jolly colour palette of pink, blues, greens and yellows the collection features a range of cute Easter themed elements for your spring craft projects. 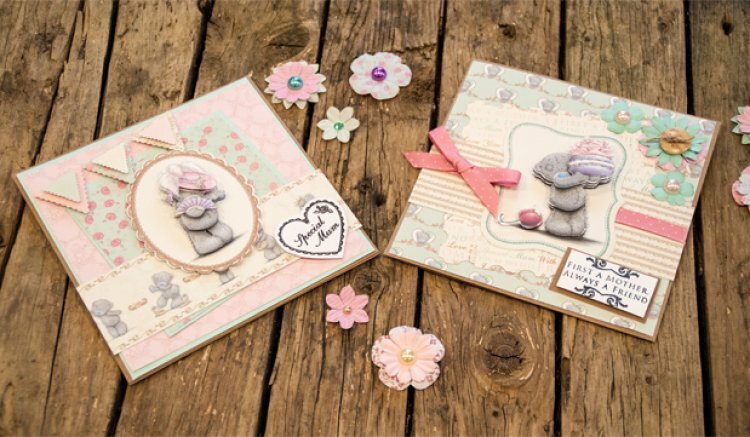 Designed with a touch of luxury the new Me to You Mother’s Day collection features a selection of gorgeous Tatty Teddy images that are perfect for the special ladies in your life. Featuring beautiful colour palettes of pink, mint and gold, to make your Mother’s Day projects truly special.